Famous Accountants is thrilled to present Little Deaths: a two person show featuring paintings of figures in ecstatic states of becoming. These are depictions of the kind of tantric, violent thunder of the self that propels one upward, toward the divine. Figures in union, dissolving into one another, rupturing and dividing… Little Deaths is a show of experimental paintings by two artists, Ana Garcés Kiley and Myles Bennett, who have developed distinctive, individual approaches to their craft. Ana Garcés Kiley was born in Colombia in 1974 and is an MFA graduate of Columbia University. Myles Bennett was born in the United States and has a Bachelor of Architecture degree from Rhode Island School of Design. Both artists live and work in Bushwick. 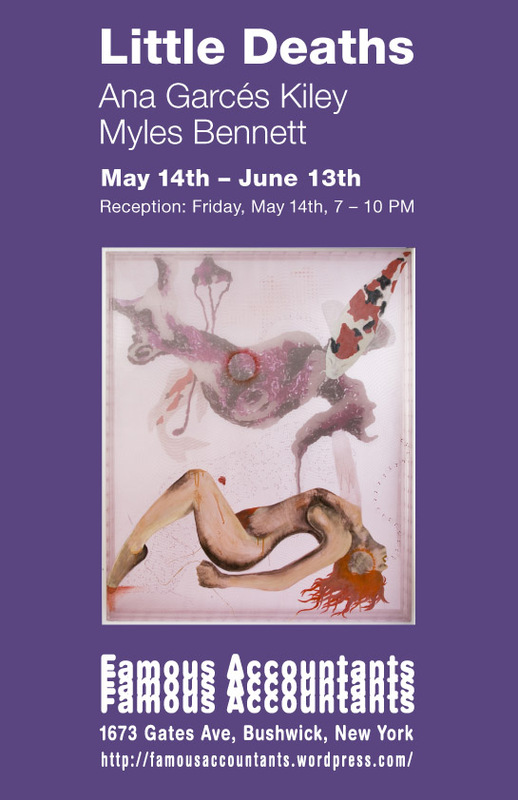 Please join us for an opening reception on Friday May 14th from 7-10PM. Famous Accountants is excited to feature Little Deaths as a part of our participation in Bushwick Open Studios 2010. Bushwick Open Studios is taking place June 4-6, 2010. Famous Accountants is a Hub Space for BOS and will be open from Noon – 7 PM on both Saturday and Sunday.